Fuji apples were created in Japan as a mixture between Red Delicious and Ralls Genet. 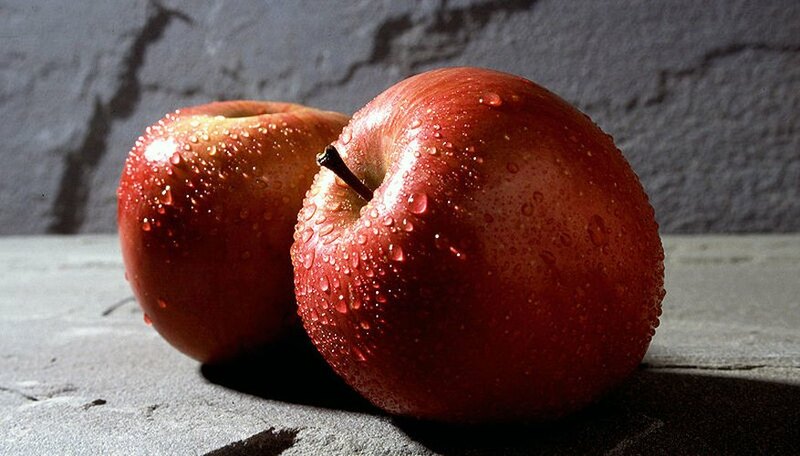 Worldwide, they are one of the most popular apples. With their sweet crispy flesh, they taste great right off the tree, although they aren't thought of as a good cooking apple. With hardiness from zone six through nine, they will grow in nearly any climate of the U.S. However, if you want your Fuji apple to tree to bear fruit you will have to plant another variety of apple tree along with it so they can pollinate each other. Rome and Braeburn are both good choices with which to do so. Choose a spot to plant your Fuji apple tree. Make sure it will get full sun. Choose a spot that is about 20 feet away from your other apple tree. Avoid low-lying areas where cold air might settle and kill the flowers. Dig a hole for your tree, about 2 feet deep and 3 feet in diameter, or 1 foot larger than the root ball. Place the tree in the hole and cover with soil. Plant your apple tree in either late fall or early spring, after the last frost. Pick any fruit or flowers off the young tree. Prune your Fuji apple tree 1 year after it was planted in early spring before the leaves sprout. Allow only one lead to grow, and remove any dead or damaged branches. Also remove any branches growing vertically. The Fuji apple's branches should fan out from the trunk, spaced 1-1/2 feet apart from each other, all the way up the tree. Water your Fuji apple tree twice a week for about 10 minutes each, watering in the spring and summer. If the weather is very dry, you can water it more often. Water it once every month in the fall and winter. Fertilize your Fuji apples trees with 10-10-10 starting in the spring after they have been planted for a year. Fertilize every year after that. Thin the fruit on your Fuji apple tree after they are about the size of a marble. Remove any damaged or misshapen fruit. Allow only about 200 apples to grow on the tree for maximum size and flavor. Harvest your apples in the fall. They are ready when they are large and redish yellow. The deeper the red the more ripe the Fuji apple is. Harvest them by twisting them off the tree. Fuji apple trees are late blooming. Be sure to choose another type of apple tree that is also late blooming for best cross-pollination compatibility. Pull any weeds or grass that is growing around the base of your Fuji apple tree. Do not allow anything to compete with it for resources. Do not allow your Fuji apple to tree to bear fruit for the first 2-3 years. Fuji apple trees are susceptible to scab. Control any outbreaks with sulfur.